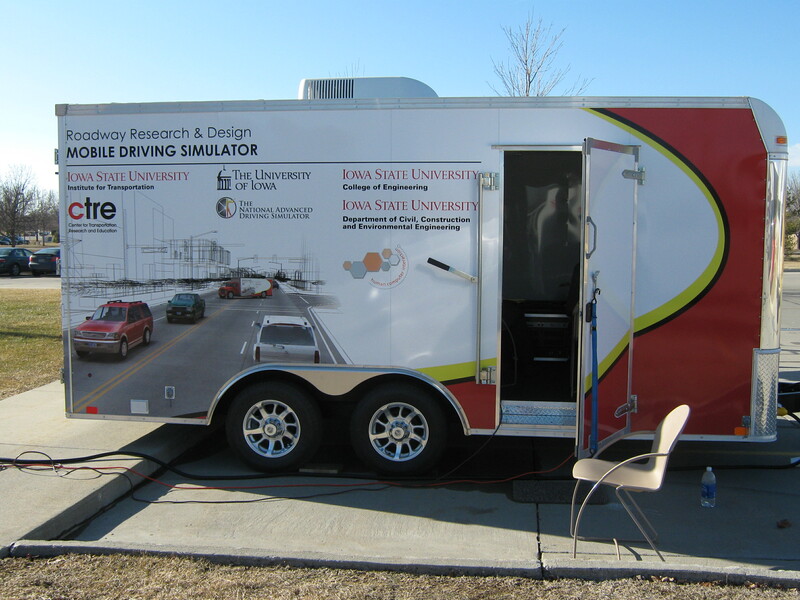 The Verasity Simulator: a cropped Corvette cab housed in a mobile trailer. The NADS miniSim™ is a portable, high-performance driving simulator designed for research, development, clinical and training applications. 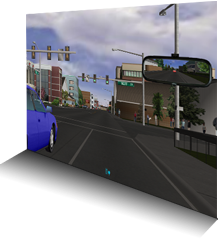 This simulator is based on the state-of-the-art driving simulation technology that has been developed through decades of research at the National Advanced Driving Simulator and The University of Iowa. 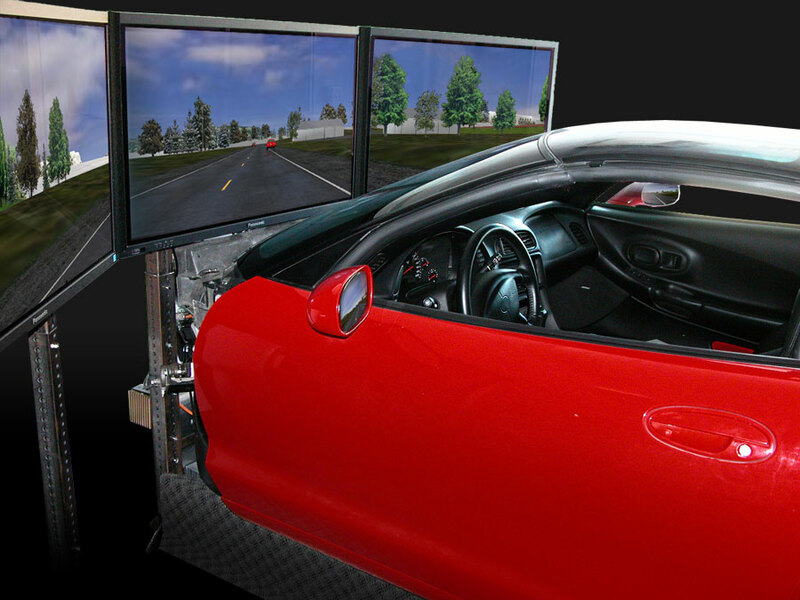 The miniSim™ harnesses the technology found in the world’s most advanced driving simulator, the NADS-1, into a smaller footprint at a lower cost. The miniSim™ has been designed to be packaged with a variety of hardware and software components tailored to suit client requirements. 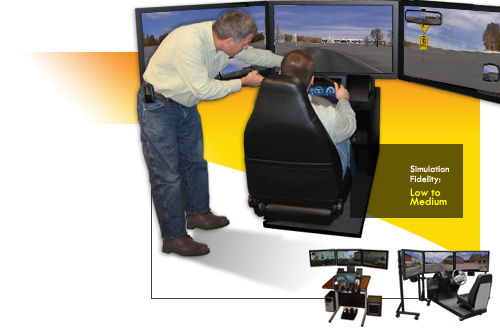 The standard miniSim™ configuration uses a single 42” inch display with steering, pedals, shifter and seat from an actual vehicle. This quarter-cab configuration also features high-fidelity surround sound audio, a LCD-based “glass dash” instrument panel and a touch-screen based operator console. Optional configurations include multiple displays, floor-mounted gear selectors and the addition of a center dash console for driver infotainment systems. The miniSim™ hardware platform has been constructed using extruded aluminum channels. These provide a solid platform and yet weigh less than other materials. The body of the simulator is mounted on casters that allow a single person to move and position the simulator. 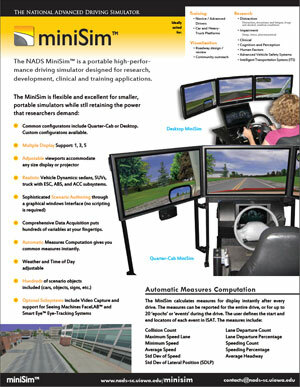 The simulator has been designed to be portable and is easy to setup, configure, operate and take down. A specially designed multiple-use crate is also available for shipping and transportation needs. The miniSim™ features the same virtual environments that have been developed and used in the more advanced NADS-1 and NADS-2 simulators. 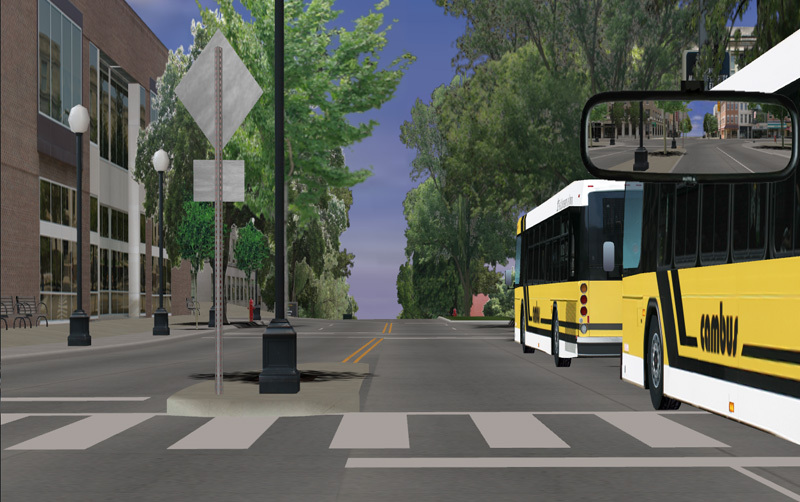 The driving environments feature urban, sub-urban, rural and interstate/highway driving areas. All roads in these environments have been designed to meet road construction standards complete with signs and traffic lights. The environments feature a variety of controlled and uncontrolled intersections including 3-ways, 4-ways and roundabouts. Non-US based driving environments are available. Time of day can be adjusted to represent day, night, dawn and dusk. Environmental conditions include dry, wet and snowy conditions. The virtual environments come with an extensive library of models of various types of car, trucks, vans, construction equipment, farm vehicle and utility vehicles. Each vehicle model has unique colors, headlights, turn/hazard signals, brake lights and 26 unique licenses plate combinations. The model library also comes with hundreds of signs including speed limit, construction, route marking and informational signs. 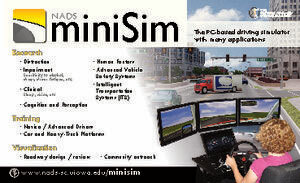 The miniSim™ utilizes NADSDyna™ - the same high-fidelity vehicle dynamics software used in the high-fidelity NADS-1 and NADS-2 driving simulators. Vehicle dynamic models are available for several types of vehicles including cars, trucks, SUVs, military vehicles, construction and farm equipment. 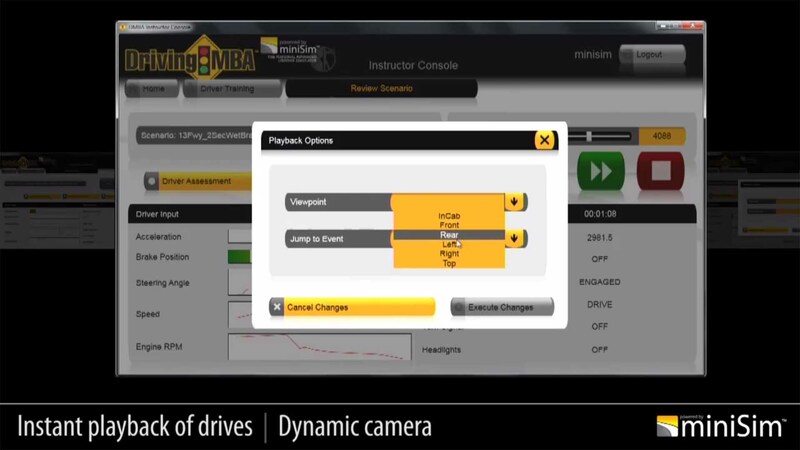 A number of the vehicle dynamics models have been independently validated by 3rd parties. Scenario authoring controls the real horsepower of the miniSim™. 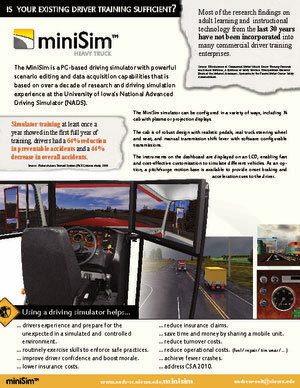 The miniSim™ is packaged with scenarios that have been designed to evaluate and test driver behavior. 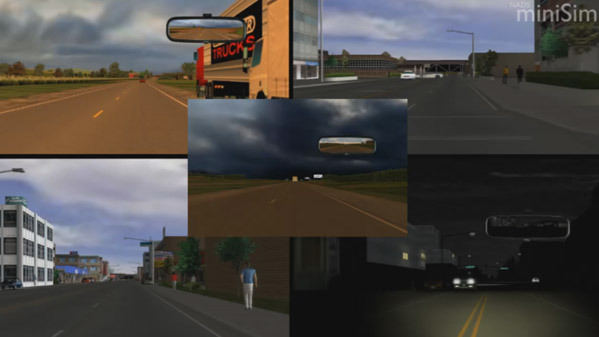 The scenario events include vehicle following, intersection navigation, yellow light dilemmas and drives that are designed to detect driver drowsiness and impairment. Users can also author their own scenarios by using the ISAT™ (Interactive Scenario Authoring Tool). This is a mature GUI-based tool that has been used by researchers and experiments to design scenarios for over a decade. The ISAT™ is currently in its 4th major revision and the newly updated interface allows users to even more quickly author scenarios of varying levels of complexity. The interface provides complete control over every single dynamics object in the virtual environment. The extensive toolset includes geographical triggers, timebased event sequencing, global timers, time-to-arrival triggers and traffic light sequencing to name a few. All autonomous scenario objects contain built-in default behaviors. Vehicles and objects general traffic rules, signs and signals. The autonomous vehicles have the ability to recognize and react to each other and the driver. These vehicles traverse the road network with little or no interaction from the user. However, every parameter may be overridden by the user by using the ISAT™. The NADS miniSim™ can be created in a form factor that is specialized to particular client requirements. The standard configuration employs a single PC that is housed within the structure of the miniSim™. Other configurations can include actual vehicle cabs (partial or full). Installation in mobile vans or trailers is also available.